"In their desperation they called out to their maker for help." In trying times, many are very likely to turn to a higher power for help. The belief and prayers help them to weather the storm and get through the rough patches. There are still times though where you need more than just faith; you need a physical manifestation of help. In Guardians #0, that help comes in the form of two superheroes to save the day. 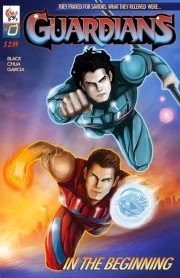 The issue is written by Todd Black, illustrated by Chua Eng Chee and colored by Alex Garcia. Delta City is a metropolis teeming with life and possibility. Unfortunately for its inhabitants, it's also rife with crime, most of which is so intense it requires the city to seek out help from a rather unlikely source. In essence, they prayed for angels to protect them and were offered Element and Chaos. These two are truly powerful and more than capable of doing their require duty and the duo is putting criminals on notice that they won't give up easily in their quest to keep Delta City safe. Black sticks with the tried and true capes and tights, superhero story, only with a slight twist on the origin. Presenting the two superheroes as a literal answer to the prayers of the citizens is rather unconventional when it comes to introducing new heroes, but it works for Guardians #0. Element and Chaos represent two sides of the proverbial coin, yet both are very much invested in protecting Delta City from the run of the mill criminals terrorizing its streets. If the issue suffers from one drawback its that is entirely narration. Considering it's a prologue, it doesn't detract too much from the issue, but the reader doesn't really get much opportunity to make their own interpretations of the characters and events. Chee's illustrations are simple enough, offering characters who are rendered very smoothly and standing out in the foreground of the panels. Some of the character anatomy is a little rigid, as if the characters are posing for their panels. He offers up a good mix of panels and layouts, with quite a few full-pagers that really hammer home the intensity that the two heroes plan to bring to their protecting. There's a limited mix of facial expressions and everyone tends to show off the same look of dismay at their current situation--including the heroes themselves. Black smartly introduces a slightly bigger challenge than random muggers and there also seems to be a burgeoning schism built into the relationship between Element and Chaos. Nothing happens in the first issue that suggests they're at odds, but it wouldn't be surprising if down the road they have a difference of opinion as far as how they should do their jobs. Chee's art is promising and he does offer a good contrast between Element and Chaos, and the two of them get most of the attention in terms of illustrations. The overall package is interesting and the creative team have set a relatively high bar in terms of keeping things interesting in future issues. Guardians #0 is available via Comixology now. Check out the book's Facebook page here.